France, host of the 10th Gay Games, saw a 15 percent jump in homophobic attacks from 2016 to 2017. 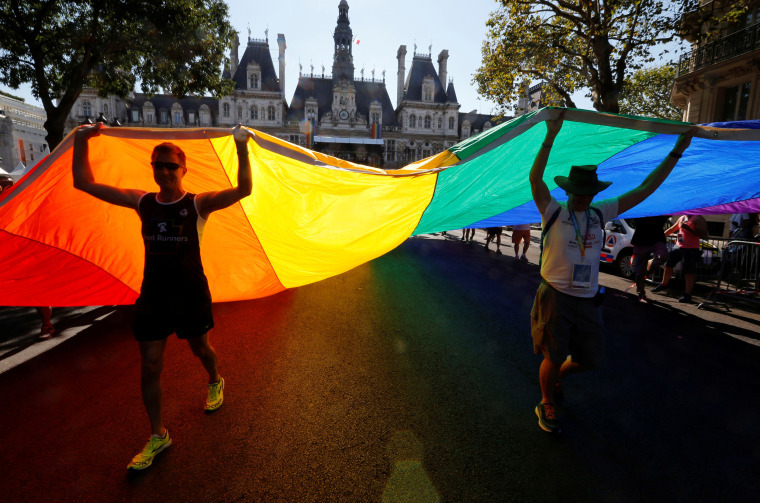 PARIS - Athletes from Saudi Arabia, Egypt and Russia were among the thousands of people convening in Paris on Saturday for the opening ceremonies of the 10th Gay Games, which aim to raise awareness about gay and transgender rights. Over 12,700 participants from 91 countries are expected during the Aug. 4-12 contest, which presents a variety of athletes — young and old, male and female, straight and gay. Fifty-eight sportspeople are from Russia, which in 2013 passed a law banning “propaganda for non-traditional sexual relations,” while one athlete holds a passport from Saudi Arabia, where homosexuality is punishable by death. The event has received broad support from the French government and is sponsored by several large corporations including the country’s largest bank BNP Paribas, carmaker Renault and General Electric.